Created by Rand Holmes this humorous cartoon strip appeared in the Georgia Straight in the early 1970’s. Hedd’s adventures ranged from selling oregano to tourists in Vancouver’s Gastown to flying back [to Vancouver} a plane load of pot from Mexico. His adventures often paralleled events in Vancouver. Holmes mocked then Mayor Tom Campbell, who was anti-pot and anti-hippie and Vancouver’s vice squad. In this way “Harold Hedd” tended to straddle the worlds of the underground or alternate and the editorial cartoon. Harold Hedd, 1, Last Gasp Eco-Funnies, 1973. Front: Illus., R. Holmes. Kitchen Sink Press, 1984. Harold Hedd, 1, Car., Rand Holmes. Last Gasp Eco-Funnies, 1973. 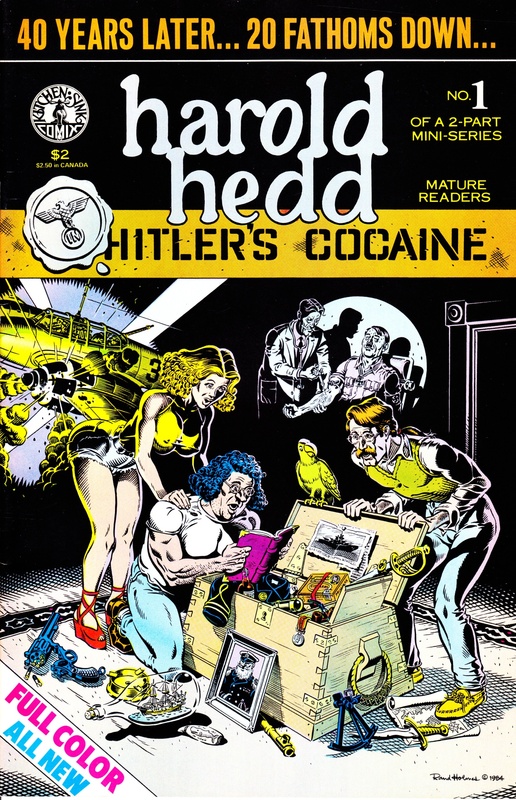 Harold Hedd: Hilter’s Cocaine. Car., R. Holmes. Kitchen Sink Press, 1984. Part., 1 of 2. Part, 2 of 2. “Harold Hedd in Wings over Tijuana.” Car., R. Holmes. Harold Hedd. 2, Last Gasp Eco-Funnies, 1973. Harold Hedd. 2, Print run 10,000 copies, December 1973, no publisher named. Distributed in Canada only by Greater Vancouver News Ltd., Identical format to Eco-Funnies issue. 5-185, July 20-21 1971: 1 & 9. 5-193, Aug. 17-20 1971: 8. 5-195, Aug. 24-27 1971: 19. 5-199, Sept. 7-11 1971: 24. 5-201, Sept. 14-17, 1971: 24. 5-211, Oct. 19-22 1971: 1+. , 5-217, Nov. 18-25 1971: 1+ 6-224, Jan. 13-20 1972: 1 & 24. 6-225, Jan. 20-27 1972: 1&4. 6-228, Feb.10 – 17 1972: 5. 6-231, Mar. 2-9 1972: 5. Rand Holmes The Artist Himself: A Rand Holmes Retrospective. Writ., Patrick Rosenkranz. Fantagraphic Books Inc., 2010. “’Harold Hedd’ creator dies.” Writ., Dana Larsen. Cannabis Culture Magazine, 18 Aug. 2002. Retrieved http://www.cannabisculture.com/v2/articles/2486.html 7/26/2010. Illus., Rand Holmes. 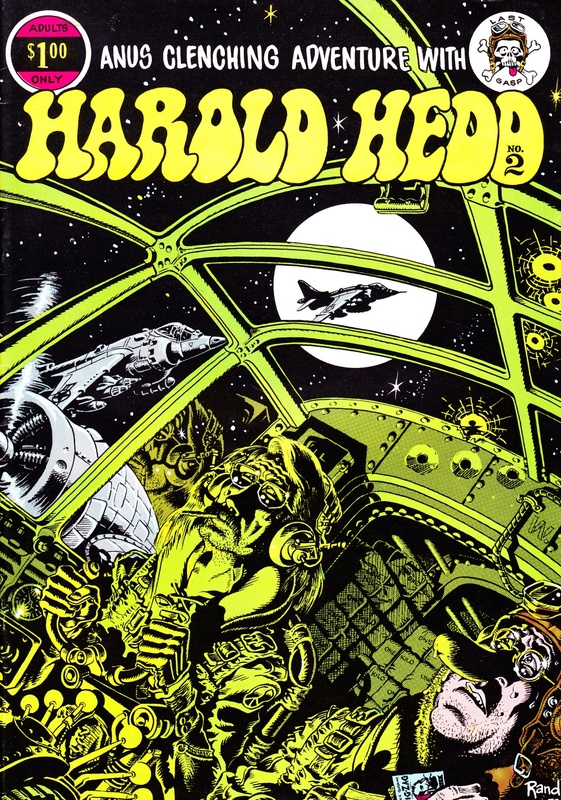 Harold Head, 2, 1973, Front cover. Illus., Rand Holmes. Harold head: Hitler’s Cocaine, part 1. Front cover.